Do you know a boy under the age of twelve who likes to sing? Saint Stephen’s Choir Academy exists to foster the artistic and intellectual development of boys and to continue the tradition of English classical choral music. The boys are taught to read and write musical notation under an internationally recognised curriculum, and they quickly become proﬁcient singing in several languages through exposure to a musical repertory spanning several centuries. This repertory is the same used at major men & boys choir institutions around the world, such as Saint Thomas Church, New York; Westminster Abbey, London; King’s College, Cambridge; and New College, Oxford. Unlike similar music education and training programmes around the region, the Choir Academy’s tuition is subsidised by full- and half-scholarships. As a result, many of the boys in the Choir Academy receive an extensive classical music education at no cost to their families. Additionally, each boy receives a monthly stipend, underscoring his professional commitment to rehearsals and performances. 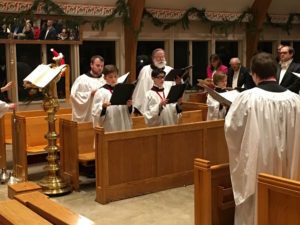 In a modern culture which often focuses attention and resources primarily on boys’ athletic development, the Choir offers an outlet for artistic expression and intellectual growth. Beyond achieving a high level of musicianship, the choirboys develop discipline, social skills, and self-conﬁdence, and they earn credentials which score well on high school and college applications and lead to scholarships. Sir Charles Villiers Stanford's setting of the Magnificat in G, sung by the choir of St John's College, Cambridge.